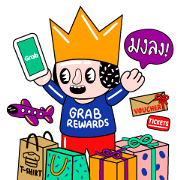 Home » GRABTAXI CO. LTD.
Brighten up your chats with this new sticker set from Grab. If you need a ride, want a package delivered, or find yourself hankering for takeout, Grab is here for you! Friend Grab’s official account to get the set for free.